A cup anemometer, like that shown in the photo here, is used to measure the wind speed from the speed of rotation of a windmill which consist of 3 or 4 hemispherical or conical cups, each fixed to the ends of horizontal arms attached to a vertical axis. 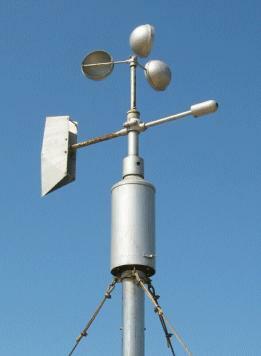 A Byram anemometer is a variety of cup anemometer. A counting anemometer has cups or a fan whose rotation is transmitted to a counter which integrates directly the air movement speed. A hand anemometer is small portable anemometer held at arm's length by an observer making a wind speed measurement. A pressure tube anemometer (Dines anemometer) is an instrument that derives wind speed from measurements of the dynamic wind pressures. Wind blowing into a tube develops a pressure greater than the static pressure, while wind blowing across a tube develops a pressure less than the static. This pressure difference is proportional to the square of the wind speed.